Snakes are pretty easy pets to care for and carpets are no exception. Create a proper thermal gradient, provide hides on the cool side and the warm side, feed the snake in it's enclosure, and let the snake do the rest. There's really not much more to it. Personally kept a garter snake when I was 7 or 8...back when hot rocks were recommended. It wrapped around the hot rock and was severely burned. I don't care what viperkeeper says or does, I think it is a stupid choice to use a hot rock based on my first hand experience. I also agree with the above posters. No a snake will not move to avoid being burned...sometimes they will coil around a bulb...why do you think people put a guard around heat bulbs? Also, like zig kind of hinted to...I think you're overthinking a lot, Kazz. Provide proper temps, humidity, water and security (hides), feed accordingly, and let the snake be a snake. Last edited by Andy_G; 08-28-18 at 10:01 PM..
Kazz have you heard the frog in boiling water metaphor? Yes. I have heard this. But viperkeeper keeps his snakes from 70-th and he has over 300 venomous snakes. well. The habitat of my snake has no changes but her behavior have changed so this is why I ask question. 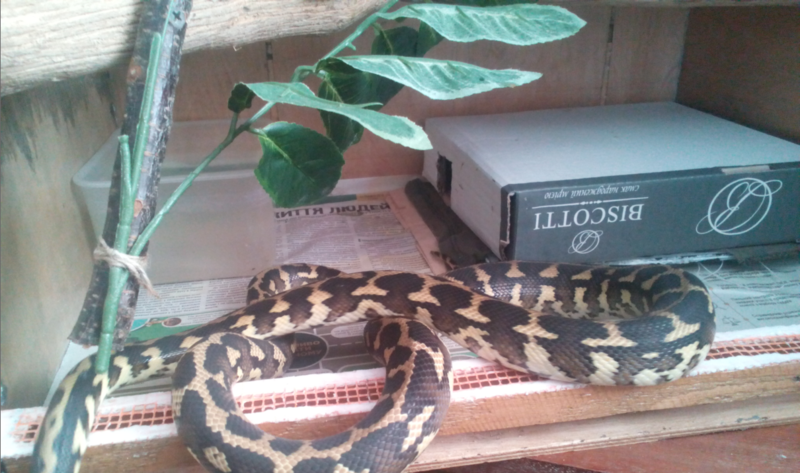 Conditions of her enclosure don't change for year except temperature of my room. On other side temperature of my room gave her a winter sense. I like his videos a lot. As he says he do educational videos and that's a true. Many people do, and he has every right to keep his animals the way he sees fit, and he has had success doing so, but that doesn't change the fact that hot rocks are absolute garbage. I'm surprised to know that he uses them and it disappoints me that he advocates them and promotes the use of them in his videos. I'm surprised to know that he uses them and it disappoints me that he advocates them and promotes the use of them in his videos. He don't advocates to use them. He just said he used them with problems. He use thermostats and hydrometer with wi-fi connection. Why snakes make great pets, and why I love them. hi , guys. I am going go on with strange behavior of my snake. Under front door of vivarium I have made an ventilation enter. It's a 2cm crack along the door. That crack covered with a grid. My snake try to find way out through that grid. She just keep doing that all the night and at the morning she don't do to her warm hide. I take her head and lead to an enter of her hide and she go to sleep. It keeps several weeks already. Viperkeeper said snakes can feel where is the wind go from and just try go there. But the matter when a snake do this heat pad is off so there is no air movement and snake can't detect where is the air coming from. I am going change coating material of walls. Still nothing out of the ordinary happening, Kazz. hi, guys. Her behavior is getting more and more strange. So I ripped off all silicone sealant from walls and covered it with several layers of acrylic varnish. Also I have remade ventilation system, renewed her hide box and enter of hide box. She stops to ram a ventilation system but started ram a glass. Usually she appear fron her hide box at 18-19h and starts ram a glass. After 3-4 hours I let her explore my room. After 2-3 hours I put her in an enclosure and finally she stops ram the glass and go to upper branches. BUT now she don't go to hide box to sleep and get warm. I take a branch with her, put a branch down and direct her head to entrance of hide-box and she so to sleep and get warm. This scenario was 7 days. Yesterdays night I didn't let her go from her viv and today at 9.00 I found her ramming a glass. She was never ramming a glass at the morning. I tried to direct her head to a hide-box and she didn't go. As far as she had heater in her hide-box I checked warm of heater and it's temperature sensor. I tried to install lower temperature to 31C. She come back to glass. I let her explore my room at day time. Only your snake really knows why she is doing this. After her, you would be better able to discover the reason. If you want someone to offer their opinion of what they think might be going on, I will oblige. It's really long & just my best guess. Short version: She's knocking to get out. You let her out, rewarding her for knocking. She repeats the behavior next time she wants out. You let her out again. Now she has trained you to let her out when she knocks. If you don't want her to knock, stop letting her out when she does it. Long version: Her behavior doesn't sound strange to me. It sounds like she was looking for a way out. She started bumping against the glass & at some point you opened it, letting her out. If that is what she wanted, then you just rewarded her for knocking. To me, it sounds like your snake has done a good job or training you. "If I keep knocking on the door, he will let me out." We can't say why she started doing this but I'm going to guess she was looking for a way out. After that, you rewarded her for knocking by letting her out. Behaviors that get rewarded have a high likelihood of being repeated. You can probably get her to stop by first making sure her cage is a place where she wants to be. After that you will need to teach her that knocking on the door will not get you to let her out. In theory, the solution is simple. Never let her out when she is knocking. Only let her out when she is NOT knocking. Note that I said, "In theory..." The problem is that while we can train our pets to do things, we can also be trained ourselves. If you don't like her behavior and can stop it by opening the door, then you have been rewarded for opening her door. That makes it more likely you will open the door the next time she knocks. While it is best if you never open the door while she's knocking, you may not be able to always follow that rule. If for some reason you feel you must open the door while she is knocking, it would be best to open it as soon as possible when she starts knocking rather than waiting a long time & then finally giving in. If you wait a long time before opening it, then you are teaching her that persistence pays off. If you don't let her out early in the behavior then absolutely don't let her out at all. If she only has to knock a couple times before you open then she learns that she doesn't have to keep repeating the behavior. She also learns that if her first couple knocks don't get a reward, she isn't going to be rewarded at all. So you are basically shortening the duration of the time she will continue knocking. When you get to that point, you should be able to stop the behavior completely by ignoring it every time. This is when the behavior stops completely because it no longer gets any reward at all. Once the behavior is gone, you want to make sure she doesn't have a need to start doing it again. Going back to the beginning of my thoughts, why does she want to get out so much? Is her cage as comfortable & interesting enough that she can be content to stay inside it? ow she has trained you to let her out when she knocks. I have thought about it. It can be true but why she stop hiding at daytime getting warn there ? It's quite cold now 20C. It's not a problem if she's getting warm while she sleeps at daytime. That's what concern me most. Because winter is coming and temperature at my room will drop to 18C, if she stops sleep in warm hide-box she get RI. What are the temperatures in her warm hide, cool hide and the high and low temps in the enclosure outside her hides?